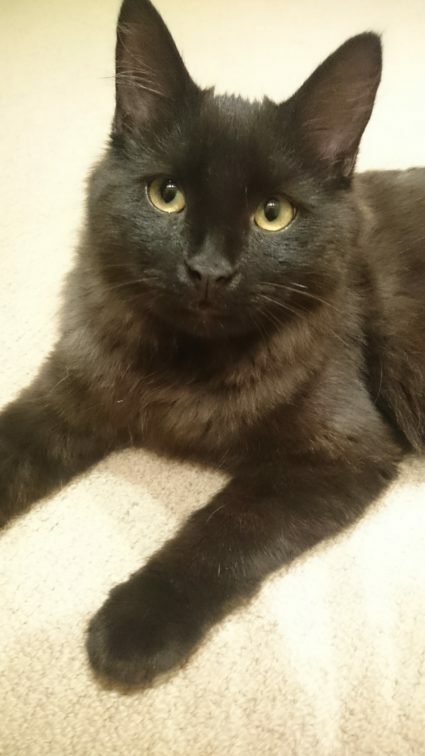 Ebony who if affectionately know as Ebby in his foster home is a beautiful male kitten aged about 4/5 months old. He is a very good looking cat … his coat is amazing, he has fabulous long hair with two different tones of black running through it and is very happy to have you brush it. Ebony has a very sweet playful personality. He is currently in foster with two other kittens his age, one sibling and Betty-Beau. He also shares a home with a nice quiet Golden Retriever whom he is very fond of. He loves to play, be cuddled and most of like he likes being fed. He eats both wet and dry food and loves both. Ebony will be vaccinated soon.